It felt like spring today and I spent it mostly outside picking up debris and sweet gum balls in the backyard. The birds were chirping bright and early, just before the crack of dawn, building a nest just outside our bedroom window sill. The daffodils are full of buds almost bursting with flowers and the mossy grass is speckled with glory of the snow blooms. Nature is coming alive, entirely confused. I soak up the rays and warm weather outside like a solar panel to refill my depleted energy and rejuvenate. It makes me simply happy. But, wait, I am not ready to bid farewell to comforting winter dishes that warm and nourish me inside. Dishes I make when I hibernate. Hibernation took a meaning of its own this past couple of weeks as Wizard isn't feeling too well. I run late to meetings only to return to an anxiety ridden crated poor pooch. The purest soul is getting old. I spoil Wizzy rotten, but as much as I love him, I welcomed the three day Presidents' Day weekend. I was out of here, gone! Jonathan on the other hand cherished just being home, watching the dog, catching an Arsenal vs Sunderland live match even with the heartbreak of not making it to the FA Cup, and doing some chores around the house. If you told me while growing up that I would taste, much less cook, Romanian dishes, when I am an adult, I would look you with an intent gaze, and then in flash, contort with flailing arms, squirm, shudder my shoulders and wrinkle my face in disgust. I would then look at you with a half smile and almost burst out in hysterical laughter at my overly dramatic display. While one of my good, not best, friends growing up was Romanian, I never had a meal in her house. Her parents were decent enough, nice people. Years later in my 30s I discovered they liked me a lot. It was a utilitarian household, curtains always drawn, dark. My friend's room was the only sunlit room in the house. Sometimes we muddled it with rings of smoke from cigarettes she would sneak into her house. I had my first puff followed by a violent cough in her room. She was an only child. Maybe the mood was reminiscent of the Eastern Block, Communism, Nicolae Ceausescu and food rations they left behind in Bucharest, but couldn't quite shake off in the new home they made for themselves in Israel. Lack of sharing food might have been a necessity, a habit, but we always considered it as cultural. Polar opposite to my own Indian and my friends' North African cultures, open with wide arms. I came to love and appreciate Balkan cuisine, for the most part, later in life. Earlier in life I was enamored with Bulgarian Marzipan and cheeses and Greek Salad. Today I share with you my winter long obsession with a Romanian style soup, Chorba (Ciorba). 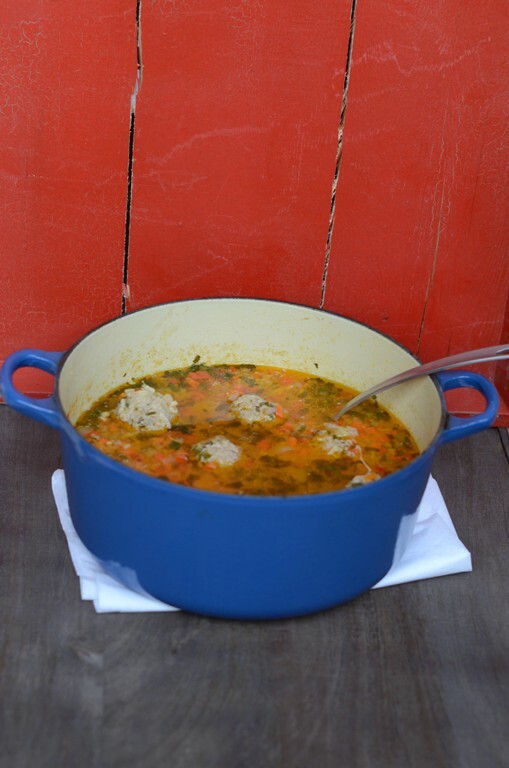 A variation of this soup is made in other Balkan nations. A surprisingly light but filling meatball rice dumplings soup with a tinge of sour, lemony notes. In a deep heavy pot, heat up the oil, add the onion, carrot, bell pepper, jalapeno, parsley and celery roots and saute on low medium heat for 10 minutes. Stir occasionally. Add water adjust for salt and bring to a boil. Reduce to low, medium simmer. In a large bowl, add all meatball ingredients except the rice, and mix well by hand. Add the rice and incorporate gently into meatball mixture. 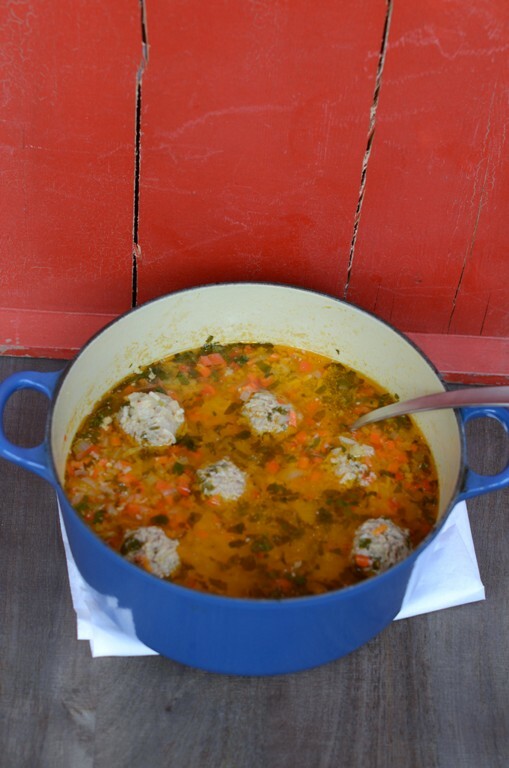 Drop small, not too tightly formed, meatballs into the simmering soup. Add rice and cook for 15 minutes and turn down heat to low medium. Add cabbage, sprig of fennel and lemon and continue cooking for 10 minutes longer. Serve hot with a slice of fresh bread. Original recipe asked for salt pickled cabbage with fennel or a sauerkraut with fennel which I didn't have, so I used cabbage, lemon and fennel instead to achieve a similar effect. I love the cabbage and celeriac in this recipe, two of my favorite winter veggies! And I agree, today was such a gorgeous day. 56 degrees on the Vineyard! I know right?! I like celeriac in mashed potatoes too. I didn't have parsley root so I just added fresh parsley leaves. I hope to be out again today. Seems sunny outside. Thx Nelly! I am not familiar with this one, although I have had many "Chorbas" in my life:) But it certainly looks good and hearty. Since we moved to SoCal, we tend to take beautiful weather for granted, but today I was outside, as the day was exceptionally wonderful. Aww Lana, TY. I bet you had so many versions. I think according to the book it is Balkan Jewish food. So might be the explanation behind the twists in the recipe?! :) Am happy you can relate to this series. J said we were on Cape Cod when Nicolae Ceausescu was executed. That soup looks really delicious and tasty! I'd love to taste it. TY Rosa! Lovely as always! Looks so hearty! I love such big pots of heat soups and stews! Found you on the fb Jewish Cooking group. Love this soup! I've made meatballs with rice, but only plain meatballs for soup ... will have to try your version. I have a beagle as well ... sometimes he stops moving long enough to pose for blog photos LOL! Welcome Dena and nice meeting you. Happy you found my site. Yes I think the rice inside the meatballs keep it airier. Cooks well right through and meatballs keep their shape well. Wizard is not a fond of the clicks the camera makes and no flash either! :)Love beagles! My hubs and son love hot chocolate too! & I wish I could send you a bowl of this. 2nd day in a row here warm as spring! I love meatballs and I can't wait to give your recipe a try! This could be my last soup of the season - I think there's time for one more! I hope wizzard is feeling a little better. I hate it when they're not well. This dish looks awesome. I'm soooo ready for spring though! Yesterday was the first day it seemed a little warmer here too. Can't wait to be outside again! Wow! It sure looks inviting. I would love to dig in right now. Soup is one of my favorite things to eat, and I crave it all year long so I can't wait to try this even if the weather is warm. What a delish soup! I love the meatball and rice dumplings combination. I want to try this recipe soon. Thanks for sharing, Shulie! Your site is looking awesome. Cheers! It's nice and warm outside which should ideally make me crave for something light. Instead, I want a bowl of that soup! A beautiful Eastern soup with ingredients and flavors vaguely reminiscent of my own Russian background - but it looks tastier than what I wouldv'e eaten at home :-) And my dog is getting old and not happy with winter either :-( It is really sad. Poor Wizzy and Marty. Huge standing ovation. Your work is SO good!! This is one tasting looking dish! I think I could make it no matter what the season was! I love the uniqueness of the ingredients as well, especially the jalapeno for that heat! Nicely done!